1. Determine your short-and long term goals for Muscular Fitness. 3. 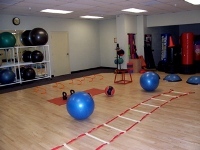 Identify areas of injury or special needs that are to be addressed. Avoiding injuries is easy if you understand that progress in any sport require consistency. Proper hydration and nutrition is essential elements in a good workout. Close attention to breathing and muscular tension is a must. Proper positioning or posture is important in maintaining the correct alignment of the spine and joints. Beginners: Repetitions 10 to 15. Intermediate: Repetitions 10 to 12. Weight: Moderate to high, last two reps should be challenging but not prohibitive. Advanced: Repetitions 6 to 8. Goal: Increase size, strength perform body part split. This may require an increase of time spent in the gym. If this occurs it is best spent more days than time per training session. Training partner may be required to prevent injury. Try to hold the object you are lifting as close to your body as possible, as you gradually straighten your legs to a standing position. Twisting can over load your spine and lead to serious injury. Make sure your feet, knees and hips are pointed in the same direction when you are lifting. When reaching for objects overhead be certain to stabilize by pulling your belly button to your spine for stability. Place one foot slightly in front of the other. Keep your torso straight and reach when possible with both arms at the same time. Engage the object, keeping your feet solid on the floor and elevate your shoulders to lift, bend at the elbows to bring down to waist level and then if it is headed for the floor bend your knees. If you are on a ladder be certain the ladder can support your weight and the weight of the object. In addition to these techniques, remember to make sure that your footing is firm before you start and that your path is clear. When you are ready to set down your load use the same techniques. It takes no more time to do a safe lift than it does to do an unsafe lift. Ergonomic Aids - this is any device that provides an external support for a joint, ligament or muscle when performing a specific movement. A back or knee brace comes under this description, as does a wrist brace while using your keyboard. In the case of lifting, jumping or stepping it is often better to do conditioning exercises to strengthen the areas in question rather than supplement your condition with an ergonomic aid. In other words if you are too weak to pick up an object, build strength or ask for assistance. Training principles to avoid plateaus and boredom. The following Training Principles are listed by the level of experience of each individual. Once these principles are understood they can be mixed and matched to meet the needs of the individual. The principles are listed progressively for beginners, then intermediate and finally for advanced lifters. These principles can help you stay interested, add variety to your workouts and assist you in making progress. In addition you will need to periodically take measurements, measure body composition and reevaluate your eating habits. As you become more experienced you will experience Intuitive Training i.e. you will sense what your body needs and how to give it the proper stimulation. Intuitive Training requires that you listen to you body's signals for rest, nourishment, and variety. Set System Training Principle: Multiple sets of each exercise. Generally two to four sets with one to four exercises per body part. Recuperation Time no less than 48 hours. Progressive Overload Principle: Increase the amount of weight to be lifted. Split System Training: Each workout focuses on one muscle group increasing the intensity of work performed. Recuperation time: 48 to 72 hours depending on the intensity. Cycle Training: Split up your year with different goals; Strength, Mass (Size), Definition (Cut). This method decreases the risk of injury, adds variety, spurs progress. Supersets Training Principle: Performing sets of two opposing muscles groups back to back. Pyramid Training: This is a base for strength and size. Start light with high reps, increase weight with each successive set while lowering the number of reps. This principle can also be done in Reverse i.e. Heavy weights with 6 to 8 reps, lighten weight 10 to 12 reps, lighter 12 to 15 reps.
Pre-Exhaustion Training Principle: Sets of a single Joint exercise followed by a multi-joint exercise. Example, Leg extensions, followed by Squats. Partial Repetition Training Principle: Lift Heavy weight with a limited range of motion, of working joint and muscle. Continuous Tension Training Principle: Controlled lift with high weights, No momentum used, full contraction forcing you to use maximum muscle tension. Forced Reps: Spotter helps you lift weight over the sticking point. Negatives: Spotter assists you in getting weight up and you go down to starting point slowly. This principle can also be taken a bit further with the spotter pressing against your top hold. The last two principles mentioned are the most intense principles and are not recommended without a spotter or professional trainer. Injuries take you away from the gym and can hinder you in reaching your goals. Setting up for Boot Camp! To avoid injury know the level of training you are capable and work within that range. Remember, size and strength can only be attained after you have developed muscle endurance. For maximum results remember we do not lift or push weight we squeeze muscles. Beginner: Repetitions 10 to 15, Weight: Light to Moderate, Goal: Build muscle endurance. Advanced: Repetitions 6 to 8, Weight: High, Goal: Increase size, strength perform body part split. This may require an increase of time spent in the gym. If this occurs it is best spent more days than time per training session. Training partner may be required to prevent injury.